Greetings, sandwich fans! I’ve just returned from a trip to New York City, so I figured I’d do a New York review. Schnipper’s Quality Kitchen is a burger joint and sandwich shop located at 41st and 8th Avenue in Manhattan, in the New York Times Building. Schnipper’s serves a number of burgers, sandwiches, and sides to its Midtown visitors, and has been featured on the Food Network’s Throwdown! With Bobby Flay. 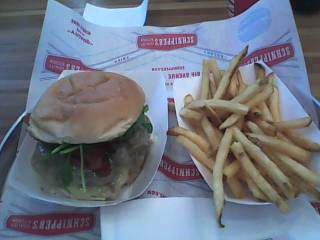 I decided to sample the Schnipper’s Classic, with a side of fries. The burger is the one on the left. The Schnipper’s Classic featured a couple of interesting items, including arugula and carmelized onions. It also included their special cheese blend (which seemed like mozzarella and Monterey Jack, but I’m not positive), bacon, and Schnipper’s Sauce, which was somewhat like Dijon mustard. The patty itself was top-notch, and they were generous with the bacon. The use of arugula gave it a flavor I hadn’t tasted before and worked well with the other elements. Overall, an excellent burger. The downside is the price. The burger alone was $8.99. Buying fries and a drink was a separate price, and not too cheap either, so the whole meal was well over the $8-$10 range. The Schnipper’s Classic is one of their more expensive sandwiches, with many of them being a dollar or so cheaper, but it’s still a little bit steep. However, if you’re on vacation and in the neighborhood, I’d recommend splurging for it. It’s not an everyday thing, but if you want a creative, high-quality burger, the Schnipper’s Classic is a good idea.